Auto Repair Tucson: Is Premium Gas Worth The Extra Money? When you’re standing at the gas pump, you’ll usually notice that there is more than one type of unleaded gas to choose from. Most people just chose the standard, unleaded gas that is typically 87 octane rating because that’s what they’ve always been told to do. If you haven’t taken some time to research this already, I’m going to give you a better idea of the differences between the three types of unleaded gas that are typically offered at gas stations, and help you determine if you’ve been choosing the right one for your car. To start off, check your car’s manual. I know, I know, this is something we all fear doing because there’s so much information to take in, and most of it is in a different language, but trust me, this won’t take long. You’re going to want to look for the section where it talks about what minimum octane level is best for your car. Most cars only need the minimum octane level which is a rating of 87, anything beyond that is not going to do much for you. This will ensure that you get the best gas mileage for your car, while at the same time, making your car last longer. Another thing you’ll want to compare is ethanol and non-ethanol fuel. Typically, gasoline with ethanol added contains 10% ethanol, commonly known as the “E10 blend”. This will reduce your gas mileage and could possibly be damaging to your car. The Environmental Protection Agency says that your mileage will drop by three percent, but others have reported much higher numbers around seven to nine percent. As far as your car’s health is concerned, ethanol is known to attract water, which can lead to poor performance for your car. With that being said, should you use E10 in your car? Well, it kind of depends. Ethanol-added gasoline has a higher octane rating than gasoline without it, meaning you’ll have better compression ratio and ignition timing but the mileage will always be less than what you could get with non-ethanol. Great for a racer, but not ideal for your average driver. So next time you see the words, “10% ethanol added” at your gas station, try to avoid, and instead go with an undistilled gasoline. Octane rating has to do with the quality of the fuel and its “antiknock” properties. Basically what this means is when combustion occurs in the engine of your car, the cylinder does not start off correctly once it makes contact with the spark plug. In turn, your car will be less efficient and may take damage over time. You want to make sure you are using fuel with high enough octane, in accordance with your manual, in order to avoid these issues. If you use an octane rating higher than what is recommended to you in your manual, you will likely see little-to-no improvement to gas mileage and efficiency. This fuel was designed for cars with high compression engines. However, under high-stress conditions like towing a large trailer, your vehicle could see some improvement to gas mileage. Are You In Need Of Repairs? 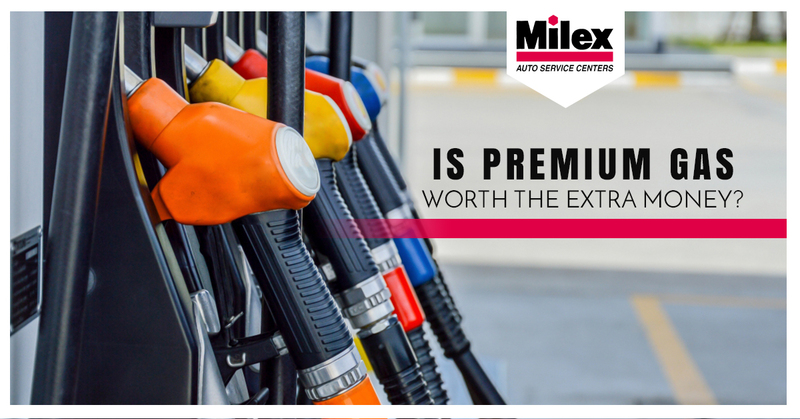 Milex Auto Service Centers is here for our Tucson clients and those in the surrounding areas. We offer experienced and knowledgeable service on both domestic and imported cars. Is transportation to and from your service appointment an issue? No problem! We offer a free shuttle service and towing. Contact us for more information about our Tucson car service, or check out our testimonials page to see how we’ve helped people like you get on the road again!